How would a commercial pet waste removal service benefit my community? As you know, residents not cleaning up their dog’s waste is a HUGE problem! Not only that, the costly time spent dealing with complaints and trying to ammend the situation never ends. We know that having a clean, safe and sanitary environment is crucial and invaluable to the health and safety of your residents and their pets. We also know that time spent on issues to remedy a dog waste situation often fails and leads to even more time wasted on this same issue. What makes The POO Crew better? Top Quality Service with “Quality Control Checks” every 3 months to ensure satisfaction! We have our own line of Biodegradable POO Bags that fit into most pet waste stations. All of your community’s pet needs can be taken care of through only one vendor!! 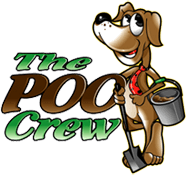 If you are intersted in obtaining a free estimate from The POO Crew for your commercial property, please complete the form below and a representative will be in contact with you. If you have dog waste stations, what type of bags do they hold?